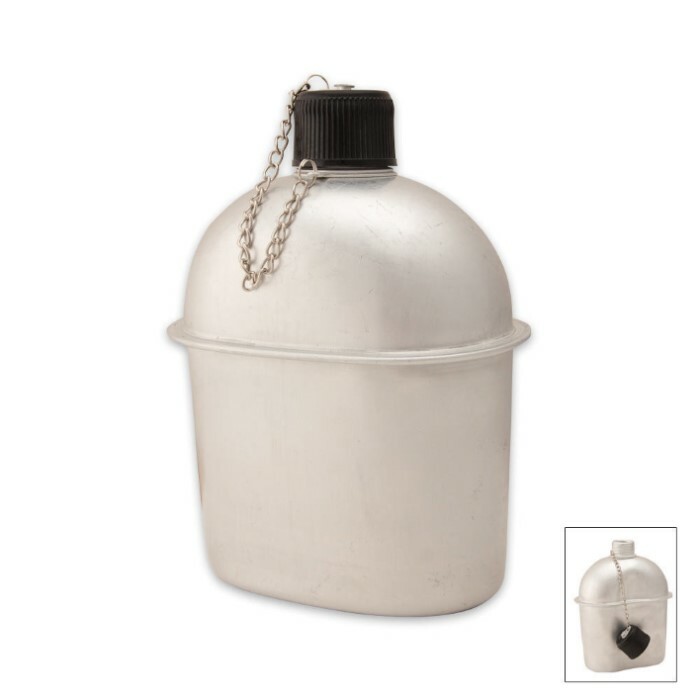 Military Style Canteen - Aluminum - 1 Qt. This classically styled canteen is new production, not military surplus. The aluminum construction makes it light weight, durable, and easy to be cleaned. Includes black plastic screw top lid with chain attachment. Holds one quart. I've been searching for a canteen for a while now until I found this one. When I tried it out with water, I could not taste any metallic or alien tastes for that matter. Even when filled, it's very light. I feel like I can carry it for miles. Might have to buy more since it's so inexpensive. It's hard to find nice canteens for good prices these days, but this one is the best. It is great for camping or hiking, or just sitting around. Has less of a metallic taste than other canteens. 1 thing to note though, when i was cleaning it with soap, i shook it several times and a little bit of water came out from under the ridge around the side, no big deal but just a note. Great canteen in any case.